Plant a tree in memory of Bryan "Barney"
Be the first to share your favorite memory, photo or story of Bryan "Barney". This memorial page is dedicated for family, friends and future generations to celebrate the life of their loved one. 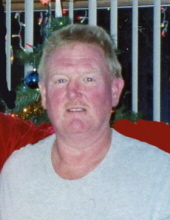 Bryan “Barney” Lee Baier, the son of Fred and Elaine (Brannan) Baier, was born August 28, 1957, at the Audubon County Memorial Hospital in Audubon, Iowa and died January 17, 2019, at the Mercy Hospital/Medical Center in Des Moines, Iowa at the age of 61 years, 4 months, and 19 days. Barney was baptized and confirmed at St. Patrick’s Catholic Church in Audubon, Iowa. He attended the Audubon Community Schools graduating with the High School Class of 1976. Over the years, Barney was employed by several area businesses. He worked for Southside Welding, the Alfalfa Mill, Deist T.V., and most recently the Audubon Furniture Mart. For many years he volunteered to feed residents at the Friendship Home in Audubon. During Christmas time he enjoyed dressing up as Santa for several different families. One of his favorite pastimes was to shine up his Cutlass and spending hours “scooping the loop”. But above all his favorite was spending time with his family and friends. Preceding him in death were his parents Fred and Elaine; his brother Rendall Baier; and his grandparents Bill and Ina Brannan and William and Edna Baier. Survivors include his special friend Kristy Bills of Audubon, Iowa; her children Matt Petersen, Megan Petersen and friend Spencer Heuton, Ben Petersen; and her grandson Garrett; his brothers and sister Terry and wife Dorene Baier of Audubon, Iowa, Jodene and husband Doug Hansen of Indianola, Iowa, and Kent and wife Carol Baier of Brayton, Iowa; his aunts and uncles Patti and husband LaVern”Bub” Deist, Jim and wife Vicki Brannan all of Audubon, Iowa, Wayne and wife Laure Sieme of Lakeway, Texas, Barbara Brannan of Pacheco, California, and Don Zwahlen of La Habra, California; nieces, nephews, other relatives and many friends. A Celebration of Life Memorial Gathering will be held Sunday, February 10, 2019, from 1:00 p.m. until 4:00 p.m. at St. Patrick’s Parish Center in Audubon, Iowa. Inurnment will be in St. Patrick’s Catholic Cemetery south of Audubon, Iowa at a later date. To plant a tree in memory of Bryan "Barney" Lee Baier, please visit our Tribute Store. "Email Address" would like to share the life celebration of Bryan "Barney" Lee Baier. Click on the "link" to go to share a favorite memory or leave a condolence message for the family.